Acidic gases - Which comprises of gases like hydrogen chloride, carbon dioxide, nitrogen dioxide and sulfur dioxide. In order to remove acidic, soluble and alkaline gases, all these require this apparatus to work. The whole idea is to bubble the mixture into the solution so that the solution can absorb the unwanted gas away. For the acidic gases, the solution will consist of an alkaline solution such as sodium hydroxide or calcium hydroxide (also known as limewater). This is because the acidic gases will be neutralized by the alkaline solution, hence the acidic gas will be removed. For the soluble gases, all we need to use is to use water, as the water soluble gases will dissolved into it and disappear! You may also notice that the delivery tube on the left is actually longer and is inserted into the solution. 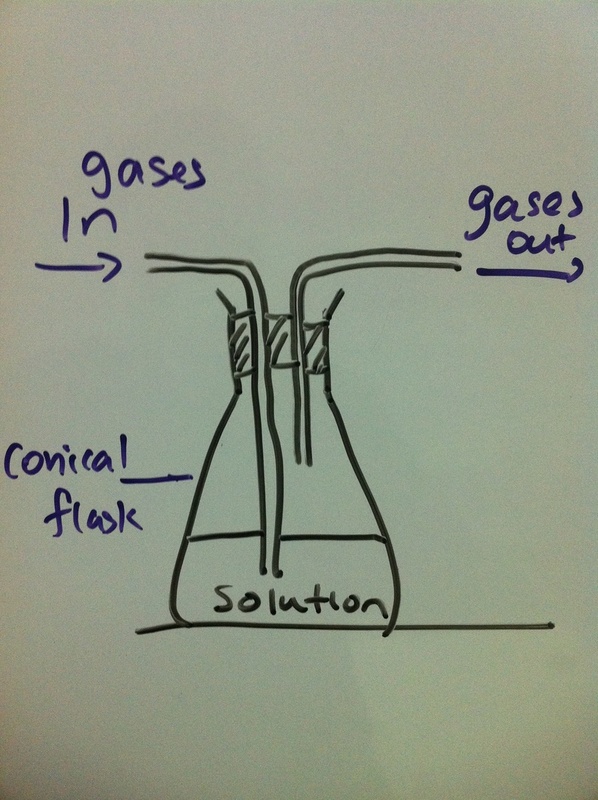 Pretty self explanatary, the tube needs to guide the gases into the solution. If the tube is above the liquid, do you think, it will bubble nicely into the liquid? Hence watch out for the drawing of the 2 delivery tubes. Finally, to remove oxygen from a mixture of gases, a hot metal typically copper is used to remove it. When the metal is heated, it has enough energy to react with the oxygen gas to form a metal oxide, typically copper (II) oxide, if we used copper metal. So that's it, these are methods to remove gases from mixture of gases. bought. install - vmate instance.